Welcome to the Week 13 Running Back Rankings! I put in a few good hours on the backs already but there is still more work to do. I’ll have the flex level options ranked a bit tighter by the time I finalize everything this weekend. There are a lot of moving backfields and backfield with new lead backs. We also have a few poorly timed injuries and one moronic suspension for Leonard Fournette. The injured backs are Melvin Gordon and Kerryon Johnson. Tough losses for those in need of Week 13 wins. For DFS, it’ll be nice to have Todd Gurley back, and we have some other nice matchups as well. Kareem Hunt, Christian McCaffrey and Aaron Jones all look pretty good with Jones being the most cost-friendly. Phillip Lindsay is another money-saver with ceiling. I’ll get into my core group of Week 13 backs for DraftKings on the Saturday podcast. 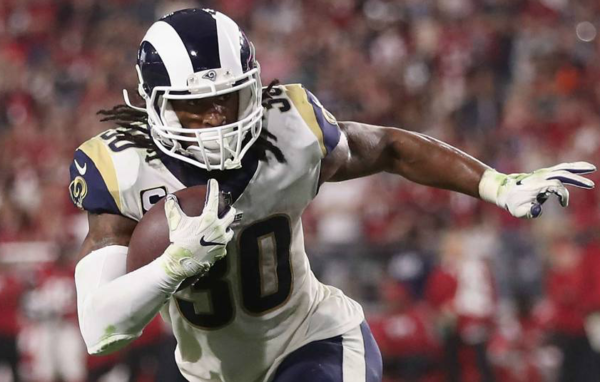 1 Todd Gurley II LAR 9.300 LAR@DET 12/02/2018 01:00PM ET He’s back and this is the only spot where he can be ranked when this offense is running well and he’s healthy. 2 Christian McCaffrey CAR 8.800 CAR@TB 12/02/2018 01:00PM ET He’s on fire and this matchup is hardly a bucket of water. 3 Saquon Barkley NYG 7.900 CHI@NYG 12/02/2018 01:00PM ET Tough matchup but he’s excelled in tough spots several time this year. 4 Aaron Jones GB 6.700 ARI@GB 12/02/2018 01:00PM ET He could do a lot fo damage here. 5 James Conner PIT 7.300 LAC@PIT 12/02/2018 08:20PM ET He’s locked into the lead role so volume is going to be there despite the tough matchup. 6 Nick Chubb CLE 7.000 CLE@HOU 12/02/2018 01:00PM ET Tough matchup this week. He’ll need the touchdowns, so Mayfield moving the ball is key. 7 Phillip Lindsay DEN 5.400 DEN@CIN 12/02/2018 01:00PM ET Great matchup for him. I could see some big plays against this team. 8 David Johnson ARI 7.400 ARI@GB 12/02/2018 01:00PM ET They need to get him more targets and a more diverse array of targets, but he’s viable here as the Pack gives up rushing yardage. He’s a has floor, but lacks his rightful ceiling due to this lost-at-sea organization. Leftwich has helped since taking over the Offense, but it’s still low end stuff due to a rookie QB and a mediocre OL. 9 Joe Mixon CIN 7.300 DEN@CIN 12/02/2018 01:00PM ET Tough matchup and he’s playing less—probably because his knee is still less than 100%. He’s only hit 20 carries once since Week 5. This is a fairly tough rushing matchup. 10 Austin Ekeler LAC 5.400 LAC@PIT 12/02/2018 08:20PM ET Volume is locked in with Gordon out. 11 Matt Breida SF 5.800 SF@SEA 12/02/2018 04:25PM ET Has a sore ankle but the way he’s played though it means you stick with him. Breida’s been incredible—playing hurt for a struggling team and getting it done most fo the time. 12 Lamar Miller HOU 4.600 CLE@HOU 12/02/2018 01:00PM ET Had him way too low by accident on Thursday. He’s a solid RB2. 13 Chris Carson SEA 5.200 SF@SEA 12/02/2018 04:25PM ET No reason to shy away here in a solid matchup and a must-win game. Seattle is making a legit playoff push, and Wilson makes them a potentially tough out. They will lean on Carson in this game as they are all-in to win. He can rest his hip later. 14 Dalvin Cook MIN 6.200 MIN@NE 12/02/2018 04:25PM ET Has plenty of upside in this matchup. He profiles as a back who could give NE problems both on the ground and as a receiver. 15 Spencer Ware KC 4.000 KC@OAK 12/02/2018 04:05PM ET He’s now the lead back in the wake of Hunt’s demise. We’ll have to see how they use him, but he could end up being a strong RB2 option the rest of the way. 16 James White NE 6.500 MIN@NE 12/02/2018 04:25PM ET They have more backs healthy now so White’s back to being a RB2. 17 Sony Michel NE 6.100 MIN@NE 12/02/2018 04:25PM ET Tough week to run. Minny ground support is strong. 18 Tarik Cohen CHI 5.600 CHI@NYG 12/02/2018 01:00PM ET His playing time has been shrinking over the last three weeks for some reason. Taquan Mizzell stole some time last week. That’s something to keep an eye on, but I expect them to get back to Cohen for obvious reasons. 19 Marlon Mack IND 5.000 IND@JAX 12/02/2018 01:00PM ET He has a concussion and a tough matchup. He’s a RB2 if he goes, and he probably will. 20 Gus Edwards BAL 4.800 BAL@ATL 12/02/2018 01:00PM ET Should get plenty of work again with Collins banged up. Has an ankle injury so keep tabs on his status, but should be ok. ***UPDATE*** He’s likley to play but may not have the high volume role we’ve seen recently. 23 T.J. Yeldon JAX 4.400 IND@JAX 12/02/2018 01:00PM ET He should get the most action but Hyde should factor in as well with Fournette out on suspension. Figure Yeldon will see a lot of passing game work and some carries as well. Hyde should get more carries early but this game should end up requiring more work from Yeldon as I expect the Colts to win cleanly. 24 Dion Lewis TEN 5.300 NYJ@TEN 12/02/2018 04:05PM ET Derrick Henry has played more recently and that’s something to watch. It makes sense, but it’s bad for Lewis in fantasy terms. 27 Chris Thompson WAS 4.500 WAS@PHI 12/03/2018 08:15PM ET Expected to return (ribs) this week. He’s now off the injurt report so good to go. 28 LeGarrette Blount DET 3.900 LAR@DET 12/02/2018 01:00PM ET Will be the lead back but in a blowout that’s going in the other direction. 29 Josh Adams PHI 4.700 WAS@PHI 12/03/2018 08:15PM ET He’s looking very good and has the gig now. ***UPDATE*** He’s now questionable with a hip injury suffred in practice. Tough spot since he’s going Monday night. Roster Clement or Smallwood if you plan to push the envelope with Adams. 32 Adrian Peterson WAS 5.100 WAS@PHI 12/03/2018 08:15PM ET Tough matchup and he’s banged up for sure with a sore shoulder and other things. Making this worse will be Chris Thompson’s return. This feel like a Thompson game too. 33 Doug Martin OAK 4.200 KC@OAK 12/02/2018 04:05PM ET He’ll get a shot at controlling the game but who knows how it’ll work. Once they get behind, it’ll be Richard and Washington. 38 Theo Riddick DET 4.700 LAR@DET 12/02/2018 01:00PM ET Gets a small bump in PPR. 50 Rex Burkhead NE 3.300 MIN@NE 12/02/2018 04:25PM ET No idea how much he’ll play. 68 Darren Sproles PHI 3.400 WAS@PHI 12/03/2018 08:15PM ET Could return this week. 71 Kenneth Dixon BAL 3.000 BAL@ATL 12/02/2018 01:00PM ET He’s been activated. 78 Ezekiel Elliott DAL 8.000 NO@DAL 11/29/2018 08:20PM ET (ALREADY PLAYED) His volume makes him a great play all the time. maybe they can shut him down but it’s only happened twice all year. He’s has 22 receptions over the last four weeks and is up to 47 on the season. 79 Alvin Kamara NO 8.400 NO@DAL 11/29/2018 08:20PM ET (ALREADY PLAYED) He should crush it here. Volume is a mild concern with Ingram involved. 80 Mark Ingram NO 5.700 NO@DAL 11/29/2018 08:20PM ET (ALREADY PLAYED) Could get some goal line love in this game, but the game flow should work for him. That’s the bigger factor. 83 Kareem Hunt KC 7.800 KC@OAK 12/02/2018 04:05PM ET Smash spot. ***UPDATE*** He’s been released and is doen for 2018.